This sweater is one of those great basic pieces you can wear for a long time. The material is very soft and not itchy. The fit is good (XS regular) with a little extra room to grow and layer. It is available in 9 different colors. I already had a drawer full of basic sweaters so I passed. You’ve seen this sweater on several bloggers. It’s super cute in person. It’s available in navy with white dots and pink with beige dots. The fit is great. I passed because I already have a similar one I bought years ago. I am one of those people who don't like to buy duplicates. 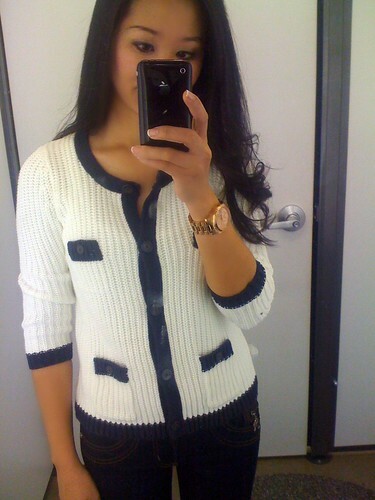 I really like this Chanel-esque cardigan in winter white with black trim. The fit is a bit boxy but doable (XS regular). I can see myself pairing it with jeans on the weekend. It’s very warm and cozy. Great price, too! This sweater is my favorite item that I tried on today. The material is super soft. I couldn’t have asked for a better fit. This is one of the dressier sweaters that can be worn for work. I can see myself pairing it with bold colored bottoms such as red, burnt orange or cobalt blue. Love your sweater picks! Is this deal valid in store only, or can it be redeemed online? Thanks. Thanks for the heads up on the Groupon! This is a great deal. The last two are my favorite of the bunch, so I'm glad you went with those! oh i love the last sweater. so cute and fits really nice sydney! now i'm thinking about getting the groupon!! Ooh, you totally scored! Love your choices here and think you settled on my two favorites! Thanks for tweeting the ON Groupon deal, Sydney. I went to ON before I knew about it, so I'll have to use it some other time. Wish you told me you were going to ON. I had a 30% off everything coupon that I could mail it to you to make your deal even sweeter. The sweaters would've cost you $11 total. I love that last sweater, too!! Thanks for sharing so many finds! You had great lighting in the dressing room!! @Vicky Aww..You're so sweet, Vicky! Thank you so much for thinking of me. You should keep the coupon for your future purchases. Old Navy has had some really cute stuff recently! I love Old Navy. Their stuff gets better and better. The polka dot one (second picture) looks so good on you. I LOVE how the polka dot sweater looks on you (much better than on me)! I actually wound up getting that same cardigan too but it looks funny on me when I button it so I'm trying to decide if I should keep it. Great picks - they both look fab! OMGGOSH the polka dot sweater is SOOO CUTE!! i'm going to look that up online NOW! i adore the chanel-esque sweater on you as well and i agree that leopard top fits you like a GLOVE! The last two are my favorites. Glad you got them! 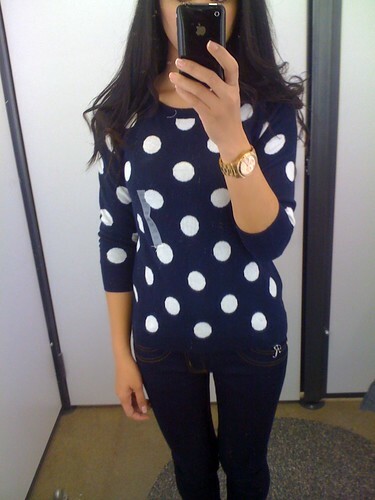 I love the navy polka dot sweater! Really goods picks. I like the last sweater also. I purchased the polka dot in navy, did not see pink! 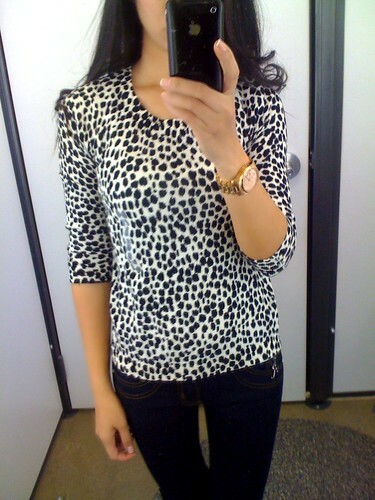 Hi..... tried this animal print sweater in the store, and i love it. When I browse through your site, i noticed you blog about this sweater as well.